Looking for [tag]free basketball coaching tips[/tag]? You’ve come to the right place! 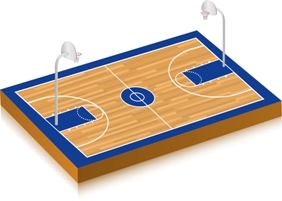 Try out this [tag]basketball[/tag] tip below and let me know how it goes for you. After a bad game… I was kind of “in the dumps”. So, the next [tag]basketball practice[/tag] I split the kids up 5 v 5 full court and let them play without my coaching. I just sat there and watched for about 45 minutes. I was able to see more… you know during a game you miss a lot. Like when you watch a video of the game. After a while, I, secretly, told my best player (who shoots a lot) that he was not allowed to shoot.. only pass. I discovered a nice 2-1-2 offense with him in the middle. I also told, secretly, a player that he was not allowed to pass. He had to find a way to score every time he had the ball. This player had a lot of potential but he passed too much, he never took the ball to the hoop. This opened his eyes a little to score some. I only needed about 8 points from him per game. Well, we went on to win 6 games in a row after that….so, at times we have to stop [tag]basketball coaching[/tag] and see what the kids can do.